Willow, Giles, Faith and Kennedy followed their real estate agent as she led them through an empty building. They talked as they walked along the empty corridors that looked abandoned for some time. The expanse of the building was huge at three stories high, containing a staircase and an elevator within. "You mentioned you're starting a school, correct?" the agent asked Giles. "Yes. More like a vocational academy." "The location is perfect then. Close to downtown, but not too close, and it does have a wonderful view of the lake," she added. "It does," Willow added, "which makes me wonder why the asking price is so low." "Yes, well…" the agent stammered. "Opportunities like this rarely happen. The seller is experiencing some…shall we say…financial difficulties." "I see," Willow replied, her eyes narrowing as she looked over the agent. "Hey," Faith interjected. "Their loss is our gain. Right?" "It might appear so," Giles said. "Come, let me show you the kitchen facilities," the agent said, moving up the stairs to the second floor. "I don't know about you, Brat, but this is getting old real fast," Faith said to Kennedy. "Wanna thumb wrestle? You know, Slayer style," she added with a cocky grin. "Yeah, cool," Kennedy replied. The two quickly moved ahead down the corridor and found an empty office. By the time the remainder of the group caught up, the two were sparring. The agent’s face paled at the scene. "Oh," Willow exclaimed, slightly embarrassed, "ignore them. They’re just practicing." "Good Lord!" the agent said. "Practicing for what? They look like they’re going to kill each other!" "Ah, no," Giles said. "One of the things we teach is the martial arts…self defense and such. Faith and Kennedy are our two best instructors." "I see," the agent said, watching the fighting pair. "What do you know about this building?" Willow asked, hoping to distract the agent. "It seems like it's been vacant for a while now." "Well, it has had its share of owners in the last few years," the agent admitted. "Not sure why, but some folks seem to think it's haunted, if you can believe such a thing. Personally, I don't believe in ghosts and I've never seen anything happen any time I've shown it. But there have been freak occurrences out here." The agent nodded but didn't add more. Faith called a time out by gesturing with her hands and nodding toward the trio. "This sounds interesting. Come on," she said as the two of them walked closer. "Well, they say the first owner went insane and committed suicide," the agent began. "I don't think an unstable person can blame a building on his problems and I think that's how the urban legend got started. The second owner just disappeared – no one ever heard from him again and the business closed. The third owner was killed by a pack of animals one night. Now, that I admit was a bit odd – since it happened here." Quickly, the agent made up for it. "Not HERE in the building but in the city. And the most recent death was a homeless man that was using the place for shelter. But as I said they’re all just urban legends and I'm sure you and your daughter will be quite happy here," she added as she pointed to Willow. 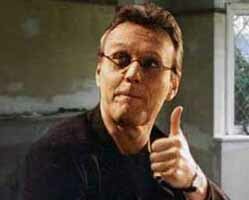 Giles smiled. "She's not my daughter." "Oh, I'm sorry," the agent quickly apologized. "You two seem so close and with the age factor, I just assumed you were family and not a couple." Giles and Willow paused a moment before they both got wide eyed. "No, we're just friends," Willow said, shaking her head. "We're not, you know, together. We're just, together." "Old friends," Giles added. "Business associates, actually." "Well it shows," the agent explained. "You two seem quite familiar with each other." Giles and Willow both gave a cautious smile and began to look around. "How many students will you have, Mr. Giles?" the agent asked. "Oh, a few," Giles said, seemingly distracted by the size of the kitchen. "Goodness, this is a nice space. Andrew will be pleased." "Yes, our…" Giles stopped, trying to figure out exactly what Andrew was. "Our house mother." Willow smirked. "Oh, I see," the agent said. "Yes, the kitchen has full facilities. It does need work. I don’t think anyone has used it for years, but I’m sure he’ll make do." "Oh, he doesn’t lack imagination I can assure you," Giles chuckled. "Yeah," Kennedy said with a grin. "Let’s see the bedrooms." "Well, there are no bedrooms, you know, it’s zoned for commercial use. But you can check with the building inspector as to what kind of modifications you can make. Come this way," the agent gestured as she left the room. Willow gave her lover an exasperated look and got a smirk in response, before they continued to stroll through the rest of the floor. The rest of the second story was filled with empty offices, all of them dirty and bleak. Doors hung askew, much of the linoleum was cracked and would have to be replaced with carpeting. Many windows were cracked, broken or missing entirely. The place reeked of mold and mildew. "It has possibilities," the agent said. "But nothing that a little paint and polish can’t fix. The third and final floor upstairs is more of the same, but the rooms are larger. Care to take a look?" "Certainly," Giles said, motioning for the agent to lead the way. As the group entered the top floor they found a large room off to the left. Willow nudged Kennedy as she pointed out the grin on Giles’ face and the wideness of his eyes. "Library," she whispered conspiratorially to the brunette. The emptiness of the room only emphasized the space. There was more than enough room for shelves, research tables and computers. "Perhaps the rest of the space on this floor can be used for classrooms?" the agent suggested. "Perhaps, perhaps," Giles said. "Are there building plans available, for this and the other building we’re interested in next door? We should have our architect review them if possible." "Of course, I’ll be happy to check on them," she answered. "If they're available, I’ll have a messenger deliver them to your hotel this afternoon." 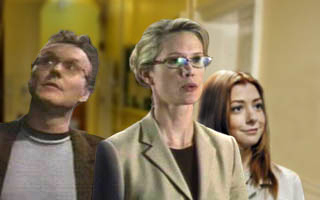 "Splendid," Giles said. "I think we’ve seen everything, then." "Well as I said, this building, although it has a colorful history, really sounds like what you’re looking for if I’m not mistaken," the agent added. Willow began to stroll around, taking it all in. "So," Willow ventured with a knowing grin. "A suicide, a disappearance and an animal attack...What do you think Giles? "You up for it?" Faith asked with a smirk. They both turned to Giles who had a growing smile on his face.